← Vanarama National League: Exciting Future or Unnecessary Rebrand? 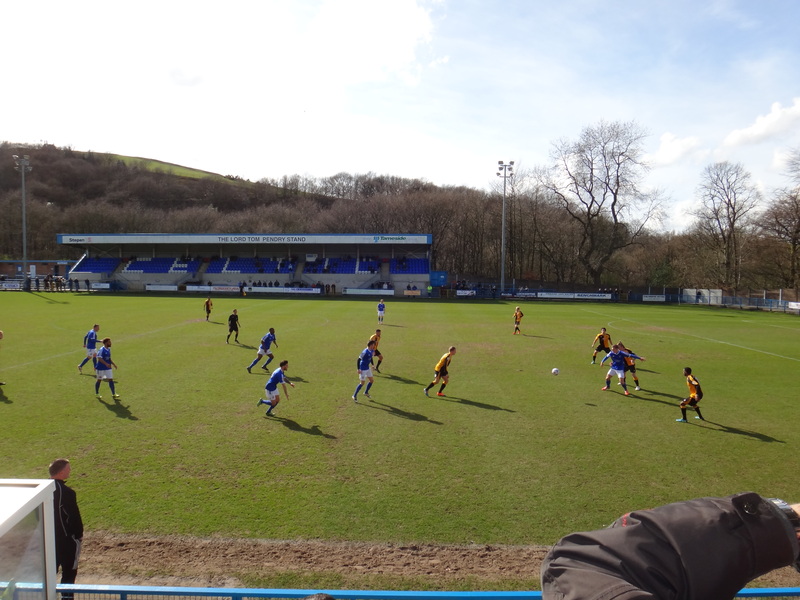 Dave A. Burin finds himself at Bower Fold for his latest Matchday Adventure. “Stalybridge is a beautiful place!”. It’s a ringing endorsement, even if it is shouted by a ludicrously drunk man, and aimed at a slightly baffled employee of Stalybridge Railway Station. ‘Beautiful’ may be somewhat of a stretch, but this small Tameside town is historic, varied and in parts, really rather nice. 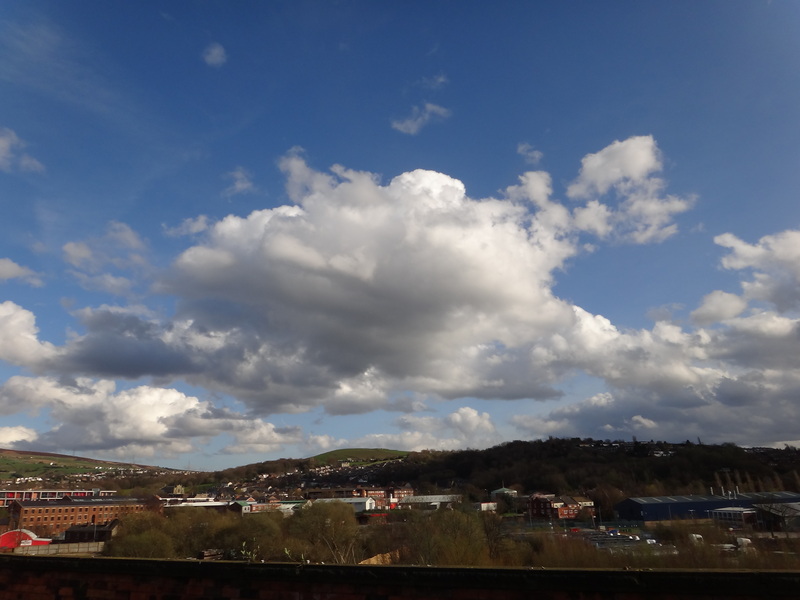 One of the bastions of the Industrial Revolution, Stalybridge was first a rural area dotted with Medieval castles, then a haven of textile manufacturing, and later a budget poker paradise – leading to its affectionate moniker of Stalyvegas. There’s something of all these elements still alive in the town, as handsome, traditional architecture clashes with ugly, imposing factories, all amidst a hilly, undulating landscape. It’s a town with a rich history – a proud history matched by that of its football club. Stalybridge Celtic were formed in 1909. Or 1906, depending on who you ask. Either way, it wasn’t too long until they entered the Football League’s Third Division North, in the summer of 1921. They spent just two seasons in the league, and despite respectable finishes of 7th and 10th place, financial issues meant that the Celts voluntarily headed back into non-league, becoming mainstays of the Cheshire County League for six decades. The 1990s saw a return to non-league’s top table, as ‘Bridge spent six years in the Football Conference, though they seem to have found their level in the current Conference North, having resided in the division since its inaugural season. 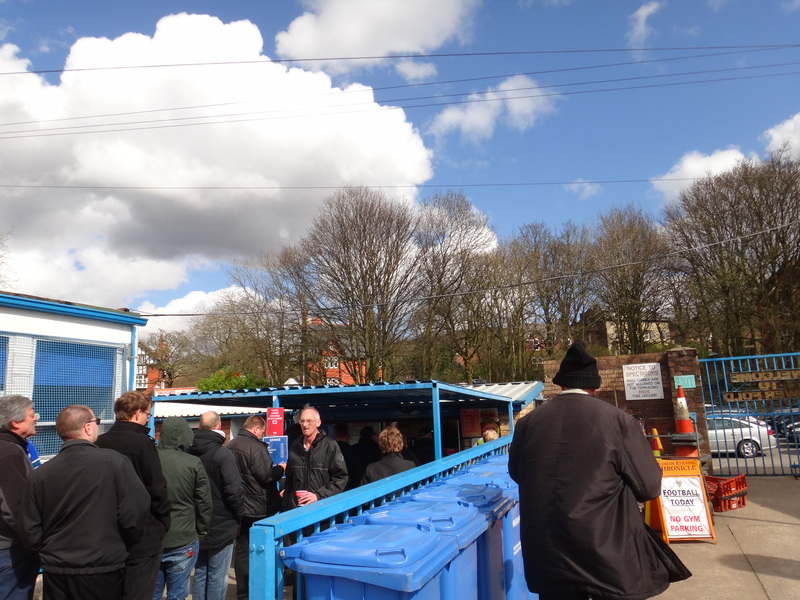 Whilst the Celts are the main attraction today, the Stalybridge Buffet Bar comes a close second. 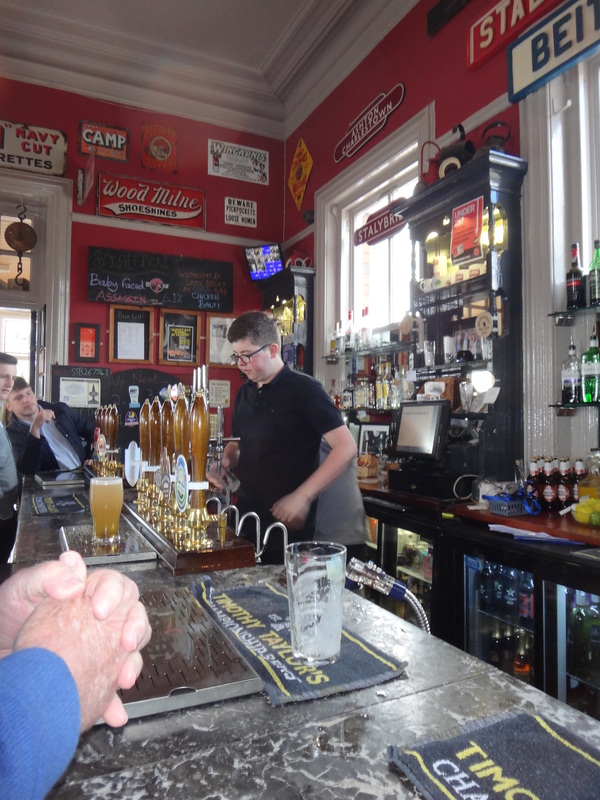 It’s my first stop upon arrival, as I make the arduous walk from one end of the railway station platform to the other, and slip onto a cosy couch in the station’s much-loved and historic pub. 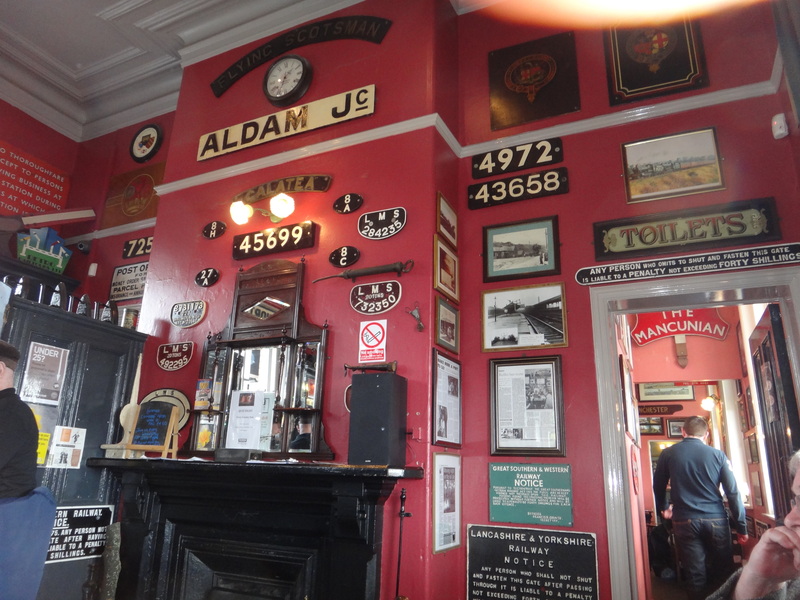 Due to an ‘over-enthusiastic’ approach to Heineken on tap last night, I can only rate the lemonade (suitably fizzy) and the décor (excellent), though the ale selection is mouth-watering, for all but the most hungover patrons. From there, it’s just a mile to Bower Fold. The home of the Celts since the first XI strode onto the pitch during the Edwardian era, the ground is a curious mixture of tradition and transformation. The Main Stand, and across the opposite side, the Lord Tom Pendry stand have both been erected during the past 20 years. Behind each goal, the older and earthier terraces, the Town End and the Mottram End, offer a glimpse of the club’s earlier days. I head down to the far turnstiles, crowding in amongst a mixture of Celts fans and visitors from East Lincs., to grab a hot cup of tea and a surprisingly good burger from the hut, and to pick up a copy of the ‘Bridge’s Bower Bulletin’ program, which, perhaps wisely, is not written entirely in bulletin form. The Bulletin is, as non-league programmes go, surprisingly high on well-written content, and unusually low on adverts for extremely niche local businesses. It does, however, inform me, of former Boston United star Bobby Svarc, “his career was curtailed by injury and he has since installed burglar alarms in Blackburn”, as if this is the automatic fate of any footballer whose career is curtailed by injury – the security firms of Blackburn heaving with a multitude of injured ex-pros. The Celts run through their fast-paced warm-up as I flick through the programme, though their apparent slickness does not carry over into the match. The smell of Bovril wafts through the air, whipped around by a blustering wind, as the sides kick-off, entering the pitch to the nostalgia-inducing strains of David Ordini’s famous themetune for ITV’s The Big Match. It is, undeniably, a big match for both sides. The opening stages, though, suggest a serious gulf in class between the sides. Boston United press immediately from the kick-off, and are ahead within a minute. Nicky Walker whips in a pacy cross, and Scott Garner connects with a firm header, which sneaks just inside the post past Celtic’s helpless ‘keeper Ross Etheridge. Moments later, Etheridge is again left stranded, as Dayle Southwell connects with another tricky ball, but his header crashes against the crossbar. Then, Etheridge saves well from a low, angled drive. It’s an opening half-hour of relentless one-way traffic, and only a string of saves from the Celts stopper keeps the deficit at one. As a confident travelling support chant away, with more than a feeling that Boston will prevail, Etheridge produces an extremely smart stop from the lively Mark Jones, snapping his legs shut to divert a strong strike away for a corner. It isn’t just the chances which divide the two teams in this first half. Whilst Boston (admittedly helped by playing down the ground’s distinctive slope) pass the ball around slickly, ‘Bridge look harried and imprecise, hoofing the ball away aimlessly, and struggling to build a move. A half-hearted (and quickly denied) penalty appeal for a blocked shot in the dying embers of the first half represents the side’s best opportunity for a goal, and after 10 points from the previous four games under new boss Liam Watson, the optimism around Bower Fold is beginning to evaporate. Of the home faithful, only Bower Badger, the club mascot has a smile on his face, and he’s probably frowning in frustration under the giant costume head. Despite football’s propensity to constantly surprise and subvert expectations, I still find myself distinctly surprised by the Celts second half improvement, as they match a side who had thoroughly outclassed them in the opening period. After surviving the brief scares of Etheridge plucking a dainty through-ball from the toes of Kyle Dixon, and Scott Garner’s mishit, deflected shot nearly bobbling into the net, in a scene of slapdash ineptitude which seemed to take place in slow-motion, the Celts grab a superb goal. A corner is fired across the box, the defence are eluded, and Michael Powell volleys home a stunning strike, and restoring parity for the Tameside club. Bower Fold is suddenly a cauldron of noise; cheers and applause ringing out as the Celts players grab onto the hero of the moment. The final 20 minutes are played out at a high intensity, but nobody comes especially close to grabbing a winner. United’s attempts at building a fresh wave of attacks are repeatedly thwarted by Celtic’s talented and tough-tackling sub Jamie Allen, whilst referee Paul Marsden waves away penalty claims at both ends with a couple of wildly overdramatic hand gestures. As the final whistle rings out, the Main Stand rises to applaud the valiant men in blue, all except for a few disappointed Pilgrims fans dotted along the rows. As the train chunters away from Stalybridge, back through rural Tameside, Michael Powell’s thunderous finish plays back in my mind. Whether or not Stalybridge Celtic can survive the drop this season remains to be seen. 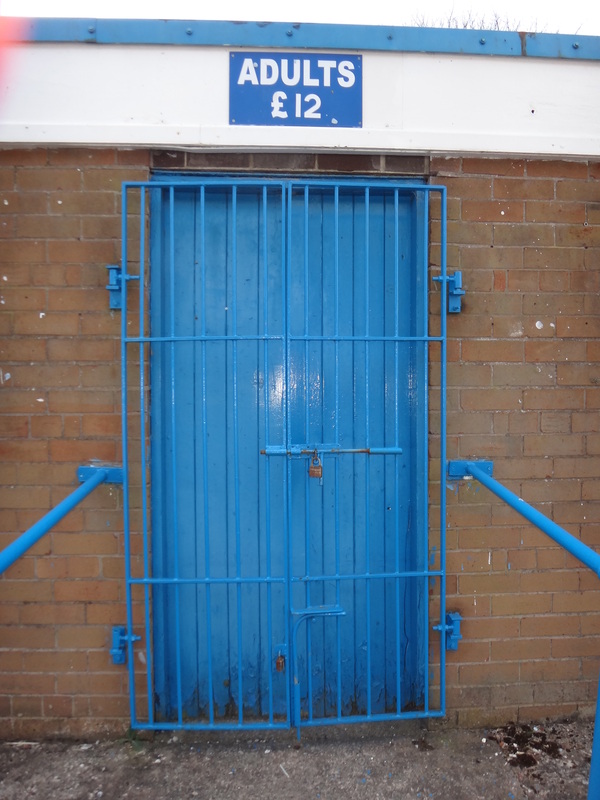 What is not in doubt is the spirit of the Celts players, and the loyalty of those who passed through the old turnstiles of Bower Fold on this windswept afternoon. Amidst the hills of East Manchester, the beautiful game is alive and well. Travel: Stalybridge Train Station is on the Liverpool Lime Street-Scarborough line, which runs hourly. There are also regular trains to & from Manchester Victoria, and Huddersfield, both of which terminate at Stalybridge. 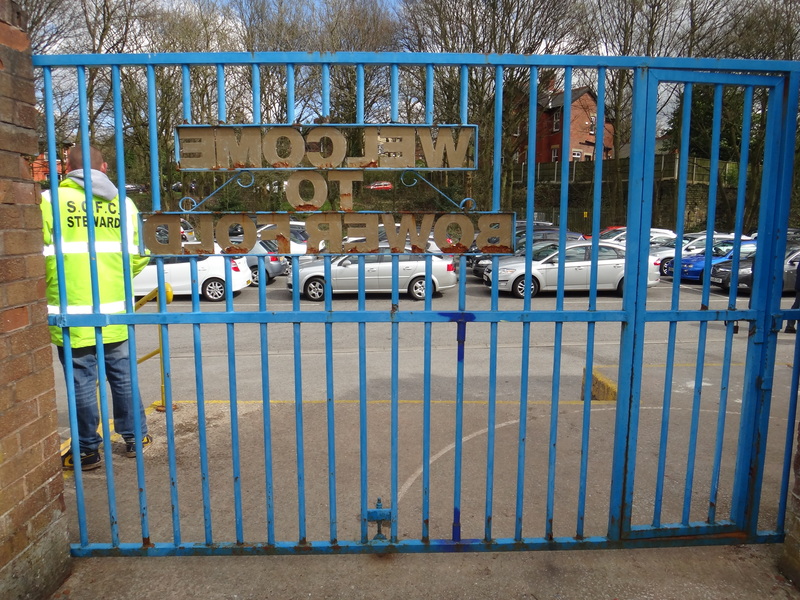 Ground Location: Bower Fold is located on Mottram Road, just over a mile from the train station. Head south over the River Tame, and continue straight down Mottram Road, where the ground is located on the right-hand side. 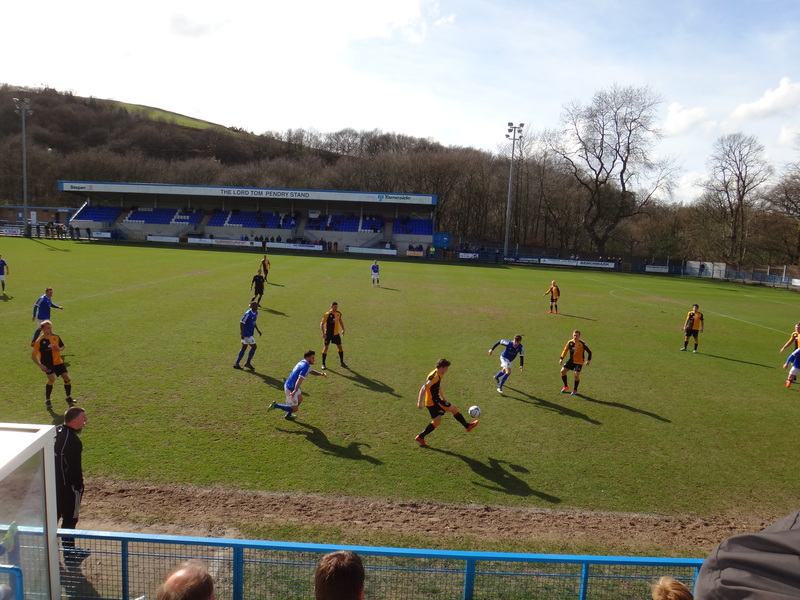 Posted on April 12, 2015, in Dave's Matchday Adventures, Vanarama NL North and tagged Boston United, Bower Fold, Groundhopping, Stalybridge Celtic, Vanarama NL North. Bookmark the permalink. Leave a comment.